Congratulations on creating a fashion walk project today. I hope you had a great time and created something fun. Don't worry if you didn't have time to finish everything you wanted to do. Remember, you can log in to Scratch anytime using your username and password to create code from any computer with an internet connection. In today's project, you learned a very important computer science concept called Iterations or Loops. Iteration is the process of repeating a set of computer instructions over and over. 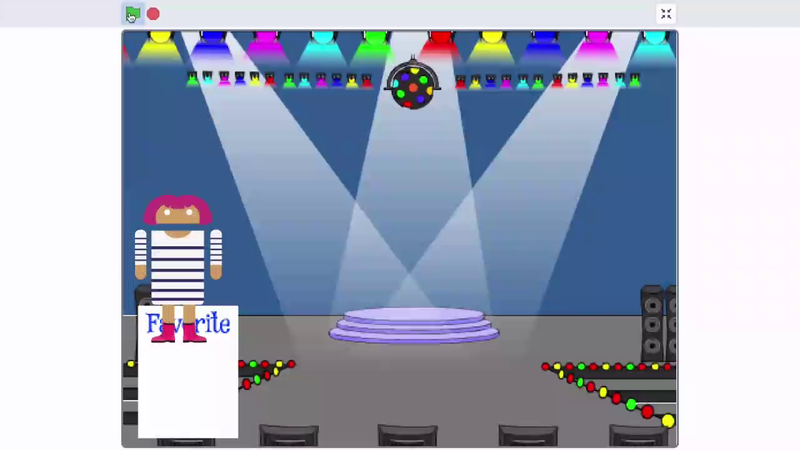 In creating the Fashion walk, you used a forever block to instruct the computer to make the sprite switch costumes, walk onto the stage, pause and walk off the stage repeatedly. Computer Science is great for automating repetitive tasks. And Computer Scientists frequently use loops or iterations to do repetitive tasks. In the first video today, you saw how Computer Science can be used to change a sprite's appearance or clothing style but the fashion industry uses technology in many other ways too. For example, in the field of wearable technology, Computer Science is used to make shoes that track steps and clothing that tracks body temperature, sleep patterns, speed and heart rate. When an athlete exercises, the clothing's computer code runs a forever loop that instructs a sensor to repeatedly check his or her heart rate. Computer Scientists like you, use forever loops or iteration in their daily jobs as they create awesome new software and inventions that impact the lives of millions. In the next club, you'll build a stylist tool that can be used to accessorize a character or room. In this example, the stylist tool shows a girl with accessories that can be customized and you'll be able to customize your tool with the accessories you want.